A lot of emails are coming in asking if I have been advising Trump on the taxes since this is similar to the plan I proposed when I testified before Congress. The answer is no. If they took the tax proposals we had worked on with members of Congress back in the nineties, who knows. 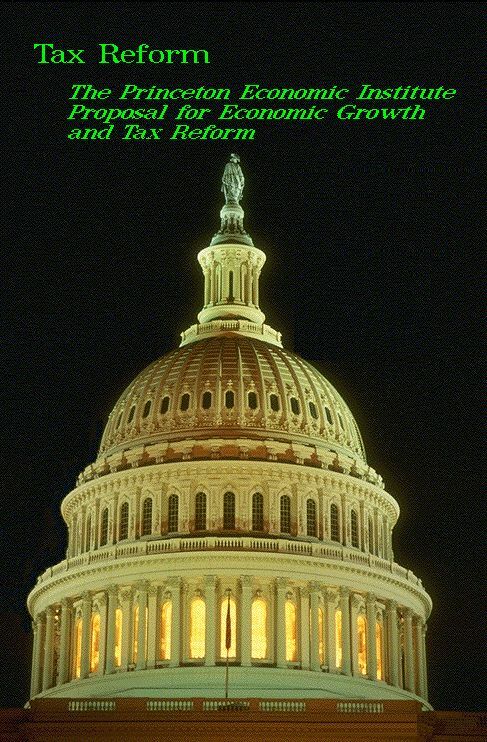 They are on file and have been endorsed by many different tax reform advocates. I have not spoken with anyone in the White House regarding taxes. I testified why the corporate tax rate must be cut to 15% before the House Ways & Means Committee. The answer is very simple. Corporations will be taxed in their home country unless they pay some tax where they are domiciled overseas. Our headquarters back then was in Hong Kong. Everyone was there because of a 15% corporate tax rate. I testified that if the US lowered the corporate tax rate to 15%, then the US would become the tax-haven and corporations would move to the States. This is a no brainer and was based on the fact that we did in fact advise multinational corporations – not just theory. I knew what they would do and would have advised them to move accordingly. The biggest problem we face is that this has to be made into a Constitutional Amendment. This is my ADVICE to Trump right now! As soon as the cycle changes and the Democrats gain control, the taxes will rise again. This is why corporations level. We LACK TAX STABILITY. Taxes become a yo-yo and business’ cannot plan long-term when the political atmosphere keeps changing between Marxism and a Free Market. This eternal battle destroys economic growth and has ruined jobs only to reduce the standard of living for the long run. A chart of the top tax brackets look like the brainwave of a schizophrenic. Trump’s tax plan reduces seven tax brackets down to three. 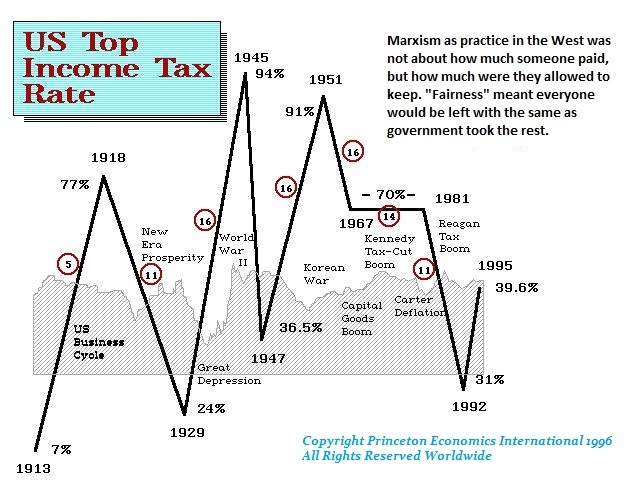 So it’s not the Flat Tax that Democrats will slam because the rich will keep more than they average person based solely on Marxism that discriminates freely against someone based upon their income. The first tax cut was JFK, the second was Reagan. This will be the biggest tax reform in US history. It does not go far enough, but it is the best we can do until there is a collapse in the monetary system that ends Marxism once and for all. 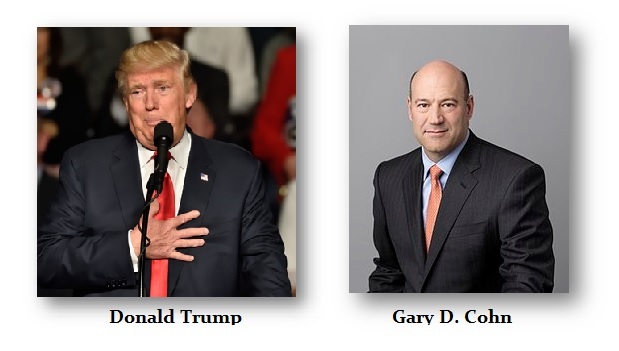 White House chief economic advisor Gary Cohn and Treasury Secretary Steven Mnuchin effectively summarized the plan to reporters. It reflects the proposal Trump outlined as a candidate keeping his word to his supporters. That in itself is really unusual for any candidate to do what they said during the election. The tax rate on repatriation of trillions of dollars offshore is still being argued with Democrats, who never saw a $1 they did not want at least 50% of. The Death Tax has been devastating to small business’ and farmers. The next generations have been compelled to sell land, the farm or close the business to pay the estate taxes. This has wiped out small farms and resulted in big corporate America producing food as small farmers were forced to sell because of taxes. Likewise, if a small business sees its owner die, the family has been forced to shut it down. This was one primary reason I have been saying we will go public or else if I died, the taxes owed for my death would result in job losses for staff. Going public was the only way to get around this to ensure the company continues. So these changes will be beneficial for the economy and this may be one of the reasons why the stock market still looks like it will double in value into the years ahead after we get past 2017 this year from Political Hell. Trump’s plan will cut the number of income tax brackets from seven to three, with a top rate of 35 percent and lower rates of 25 percent and 10 percent. It is not clear what income ranges will fall under those brackets. It would also double the standard deduction. The proposal will chop the corporate tax rate to 15 percent from 35 percent. It would eliminate tax deductions with only a few exceptions, including the mortgage interest and charitable contribution deductions. The plan would get rid of the estate tax, otherwise known as the “death tax.” Cohn said that the move will help privately-held businesses and American farmers. Analysis of the estate tax reveals that it affects only a very small portion of Americans. Mnuchin also said the U.S. would go to a “territorial” tax system. Though further details were not forthcoming, such systems typically exclude most or all of the income that businesses earn overseas. Trump’s plan would also repeal the alternative minimum tax and 3.8 percent Obamacare taxes.